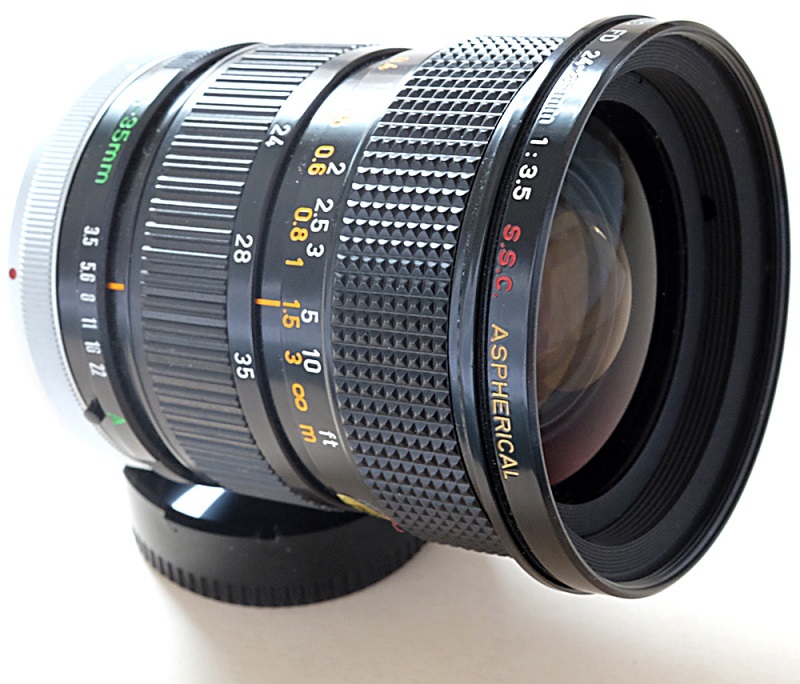 Lens Lab: Hire the Canon FD 24-35 mm F3.5 aspheric. Canon FD 24-35 mm F3.5 aspheric. Originally, first introduced back in 1978 as a Canon FD 24-35mm f/3.5 S. S. C. ASPH and upgraded a year later as Canon FD 24-35mm f/3.5L in 1979 with a revised FD lens coupling at its rear. Optically, bith lenses are the same except for the updated version is lighter. This appealing lens, the first wide-angle zoom in the world to offer an aspherical element, covers an angle of view from 84° to 63 °. The aspherical surface of its first element minimizes barrel distortion at short focal lengths and effectively controls curvature of field (an error which affects image quality by fall-off of sharpness towards the edges), coma, astigmatism, and lateral chromatic aberration. The optical performance of this lens virtually exceeds the performance of a fixed focal length lens.